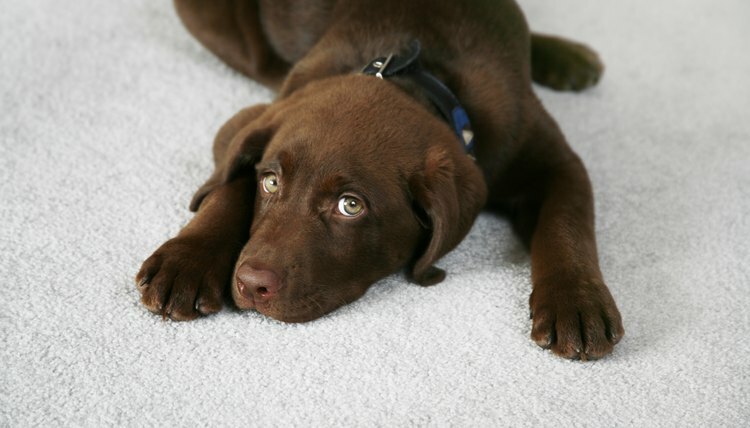 Dog urine in your carpet can give your whole house an unpleasant smell. Once your dog has relieved himself in one spot he will keep coming back to it as long as it smells of urine. To prevent odors and further problems, make sure to find and thoroughly clean all accidents as soon as possible. Purchase products made for the job or create your own from common household products. Before applying anything to your carpet, test the product on a small, hidden area, such as in a closet or hidden corner, to make sure that it won’t affect the color. When you find a fresh doggy accident, the first step is to clean up as much of the urine as possible. Use paper towels, newspapers or rags to blot the area, soaking up all the urine you can. Keep blotting the area until you can’t get anymore urine out of the carpet. Sometimes you can smell the urine but you can’t find it. This is especially true of old, dry stains. To locate these, use a handheld black light in a darkened room to find the spots, which will glow under the black light. Buy an enzymatic cleaner made for dealing with pet urine. These are available in pet stores, feed stores and many online shops. Follow the directions on the bottle. Typically you must soak the area of the carpet where the urine is lurking. You need to use enough to soak the pad underneath the carpet as well. Allow the cleaner to dry on the carpet; urine odors will be removed by the enzymes in the cleaner. If you’re dealing with more than just one spot, you may want to use a wet vacuum or an extractor system, which you can rent from hardware or grocery stores. Use plain water in the extractor or soak the area with water and then use the wet vac to lift the water and the remaining urine out of the carpet. The Humane Society of the United States advises against using a steam cleaner, as the heat will cause the odor and stain to become a permanent part of your carpet. If you wish, follow the cleaning process with a deodorizing product made to handle pet urine odors. To begin cleaning with a home remedy, locate the source of the odor and make sure any fresh urine has been blotted up. Create a mixture of half water and half white vinegar and saturate the area to be treated. Allow the carpet to dry. Mix 1 part dish detergent to 4 parts of hydrogen peroxide. Sprinkle a generous layer of baking soda over the area and apply light covering of the peroxide mixture. Use a stiff brush to work it into the carpet. Allow the area to dry. Repeat if any odor lingers. If one area of your carpet is heavily soiled and you are unable to clean it, cut out that section of carpet and the padding underneath and replace it with a new, unsoiled section. This can be very visible, depending on your carpet type, so use caution when taking this step.